From 23 to 29 September 2013 took place in the Bay of Seine, the shooting of the underwater part of « Les Fantômes de la Manche » (Ghosts of the Channel), a 52-minute documentary involving German submarines wrecks and a human adventure based on diving. An operation which followed the trip organized in Germany in September 2012. Jean-Louis Maurette and Stéphane L'Hôte. Directed by the C-3D Convergence images company from Rouen, the shooting team consisted of Alban Vian, producer and director, Stéphane L’Hôte (website), shooting operator and Bruno Delande, sound operator, also all three photojournalists. 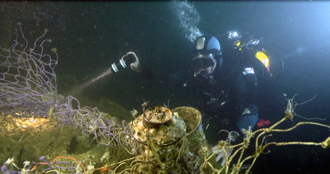 Underwater views were conducted by Jacques Le Lay (Haliotis explo vidéo) and the Canadian Nathalie Lasselin (Pixnat Underwater Films). 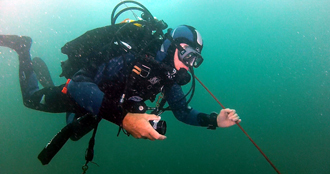 Two Norman diving clubs affiliated to the F.F.E.S.S.M. were part of the operation and ensured the transport on the dive sites of the various stakeholders, also the management of diving and logistics : Caen Plongée with its chairman Richard Farizon (also chairman of the FFESSM departmental committee of Calvados and who was involved in the action), together with Alexandre Frugier, in charge of security, and Club Subaquatique de Caen with its chairman Claude Renaud. The gases and technical equipments supply were up to Tek Plongée Odyssée with Emmanuel Lecomte as team-member of rebreather divers and Dominique Francoise. 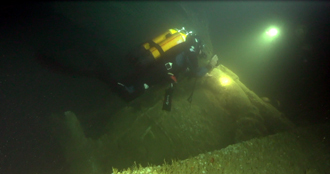 The historical part of this documentary is approached by l'Expédition Scyllias with Jean-Louis Maurette, diver, as well as Marc and Luc Braeuer, curators of the Mémorial de Quinéville. A meeting of stakeholders from different backgrounds, passionate with scuba diving, underwater heritage and contemporary history, which allowed the C-3D Convergence images company to complete its task despite changing weather and an environment becoming particularly difficult at the end of the shooting with a sea state 5. On the left : teams of divers are heading at full throttle toward one of the wrecksites. Centre : Jean-Louis gegibs diving in green water. On the right : Jean-Louis is wandering around the coning tower of U 390. 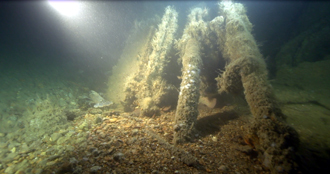 On the left : the remnants of the double-barrelled anti-aircraft 2 cm C/38 gun carriage are nowadays lying on the seabed. Centre Jean-Louis Maurette is investigating the top of the coning tower. In the foreground appears the sky-search periscop housing (unfortunately blown off). 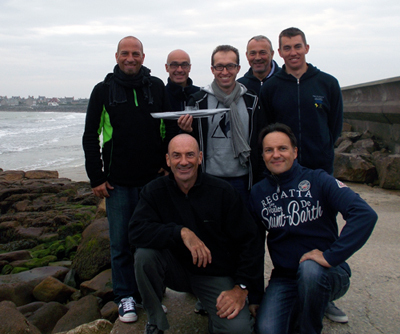 On the right : (l to r) Luc Braeuer - Bruno Delande - Alban Vian - Marc Braeuer - Jean-Louis Maurette. Two U-Boote wrecks were used for the scenario, one located about fifteen nautical miles from Barfleur where was based the team, and the other one about thirty nautical miles, both sitting by 50 m depth. These were therefore tricky dives as far offshore, relatively deep and subject to strong stream areas with the presence of fishing or commercial vessels. 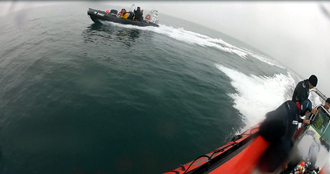 One had to know perfectly the diving conditions in the Channel and be expertly backed up by faultless organisation. Norman divers knew how to face each logistic phases of this part of the shoot, preparing moorings, providing support as lighting and cameramen. The underwater cameramen and actors were thus able to work with mind freed of any restrictions and with maximum safety. This gathering of diverse skills highlighted the dynamism of both clubs from Caen where the spirit of adventure and thirst for discovery are present, all in compliance with safety rules, with remarkable efficiency and a constant good humour. The release of the documentary « Les Fantômes de la Manche » is scheduled for Spring 2014, with the first broadcasts on France 3 Ouest chanel.